Cataracts make the lens of your eye less transparent and appear cloudy. This can make your vision blurred or misty. You're more likely to have cataracts as you get older. In the UK, age-related cataracts affect around half of people over 65. Cataracts can sometimes affect children too. Your lens is near the front of your eye, just behind your iris (the coloured part of your eye). It’s normally clear and helps you to see things in focus. 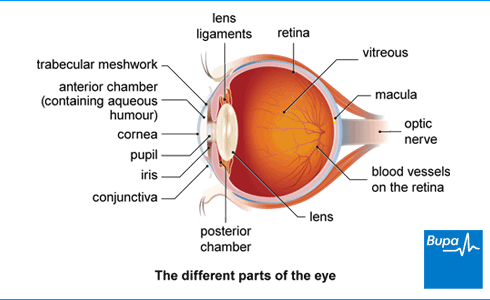 Your lens directs light rays on to the back of your eyeball (retina), to form an image, which is then sent to your brain. If your lens becomes cloudy from a cataract, your vision will become blurred. Cataracts usually develop over a long period of time, causing your eyesight to gradually get worse. Cataracts can affect one or both of your eyes. Cataracts usually only need to be removed if they interfere with your daily life, such as reading or driving safely at night. If you have a cataract, you may not notice any symptoms at first. Your symptoms will depend on where your cataract is, its size and if you have a cataract in one or both of your eyes. If you have cataracts, you may notice that the prescription for your glasses or contact lenses changes more frequently. You may also start to have problems driving, especially at night. It’s possible that some of these symptoms could be caused by problems other than cataracts, such as diabetes. So, if you notice any problems with your vision, make an appointment with your optometrist. An optometrist is a registered healthcare professional who examines eyes, tests sight and dispenses glasses and contact lenses. If you think you have symptoms of cataracts, you should get your eyes tested by an optometrist. They will look into your eyes using a special instrument called an ophthalmoscope. If you have a cataract, the optometrist will be able to see that the lens of your eye is cloudy. Your lens may appear brown or white when they shine a bright light into your eye. Your optometrist will then refer you to an ophthalmologist for treatment. An ophthalmologist is a doctor who specialises in eye health. It’s possible that you may be diagnosed with a cataract during a routine eye test, even if you haven’t had any symptoms. This is because changes in your lens can develop gradually over many years– so you may not notice symptoms at first. If you have cataracts, stronger glasses or contact lenses may help improve your symptoms. Your optometrist will change your prescription if they think this will help. You may also find it easier to read if you don’t sit too close to a light. But because your cataracts will probably get worse over time, these are only short-term solutions. Removing your cataract with surgery is the only way to restore your vision to normal. Occasionally, cataracts can mask other eye conditions, such as glaucoma and age-related macular degeneration. In these situations, your vision may not improve following cataract surgery. Your ophthalmologist will discuss with you whether surgery is right for you. This will depend on many factors, such as how much your cataract is affecting your daily activities. The most common procedure for removing cataracts is called phacoemulsification. It usually takes around 30 minutes and is carried out under local anaesthesia. In the procedure, your surgeon will use a special probe to destroy your cloudy lens with ultrasound. This is then taken out and replaced with a lens made of a clear, artificial material, such as plastic. Your surgeon will only operate on one eye at a time. If you have cataracts in both eyes, your eye with the worst vision will be treated first. You will have the second procedure once your surgeon knows that the first one worked well. See our cataract surgery topic for more information on how the surgery is carried out, and about after care and recovery. Children may have cataracts when they’re born. This may be because cataracts run in the family, but they can also be caused by an infection in the womb, such as rubella. If your cataract isn’t treated, you may eventually lose your vision completely. But cataracts are normally diagnosed and treated well before they affect your vision severely. Occasionally, cataracts can cause angle-closure glaucoma. If you have angle-closure glaucoma, the pressure in your eye increases very quickly. It can cause severe pain in your eye. You may also feel sick. If you develop these symptoms, you should seek medical help straight away to make sure your sight isn’t permanently damaged. Can my cataract come back after surgery? Can my cataract come back after surgery? No, your cataract can’t come back after surgery. This is because your natural lens has been removed. Sometimes though, cataract surgery can cause a condition called posterior capsule opacification. This can make your vision cloudy, but it’s not the same as a cataract. It's caused by a thickening of your natural lens casing – the part of your eye that holds your lens in place. This lens casing isn't usually removed during surgery because it’s used to hold the new artificial lens in place. Around one in 10 people find posterior capsule opacification affects their vision after cataract surgery. If you’re affected, you will be offered a minor laser procedure to restore your vision. This can usually be done in an outpatient clinic. Can I drive if I have cataracts? Can I drive if I have cataracts? This will depend on how severe your cataract is and if your sight is within the legal limits for driving. By law, your vision must meet certain criteria so that you can hold a driving licence. These standards are set by the Driving and Vehicle Licensing Agency (DVLA). It’s fine if you need to wear glasses or contact lenses to meet the criteria. The DVLA standards say that you must be able to read a vehicle's registration plate in good light from 20m away. If the registration plate dates from before September 2001, you must be able read it from 20.5m away. You shouldn't drive if you can't read a registration plate at these distances. You must also have a score of at least 6/12 on a Snellen test. This is a test for visual acuity (how much detail you can see). Your optometrist or ophthalmologist will be able to test whether your vision meets the standards. If you can read a number plate according to the DVLA standards but suffer from glare, this can also affect your ability to drive. If your cataract isn’t affecting your vision, it’s often safe for you to drive and you may not need to tell the DVLA. If you're concerned whether or not your vision meets the DVLA standards, book a sight test with your optometrist or contact the DVLA. How quickly will I lose my sight? How quickly will I lose my sight? This will vary from person to person. Your vision will probably keep getting worse if you don't have your cataract removed. This may happen slowly, sometimes over a number of years. You may not realise at first that you have a cataract if the changes are gradual. Over time, you may notice your vision is cloudier and colours seem faded. You’re less likely to notice these symptoms if just one of your eyes is affected. If both of your eyes are affected, you may also find it more difficult to judge distances properly. If you do lose your sight because of cataracts, it may be possible to restore it with surgery. But if your symptoms are caused by another undiagnosed eye condition, such as glaucoma, surgery may not help to improve it. Cataract surgery is an operation to remove the cloudy lens and replace it with an artificial one. Corticosteroids are a man-made (synthetic) type of steroid which are used to treat many different medical conditions. Reviewed by Pippa Coulter, Specialist Health Editor, Bupa Health Content Team, August 2016.